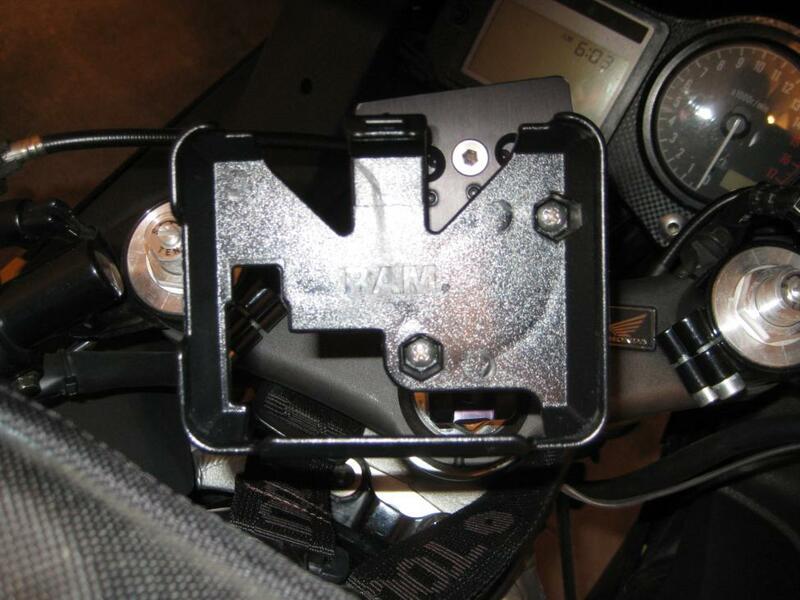 It's just a mounting plate with some holes to screw in a mounting bracket for your specific GPS unit. 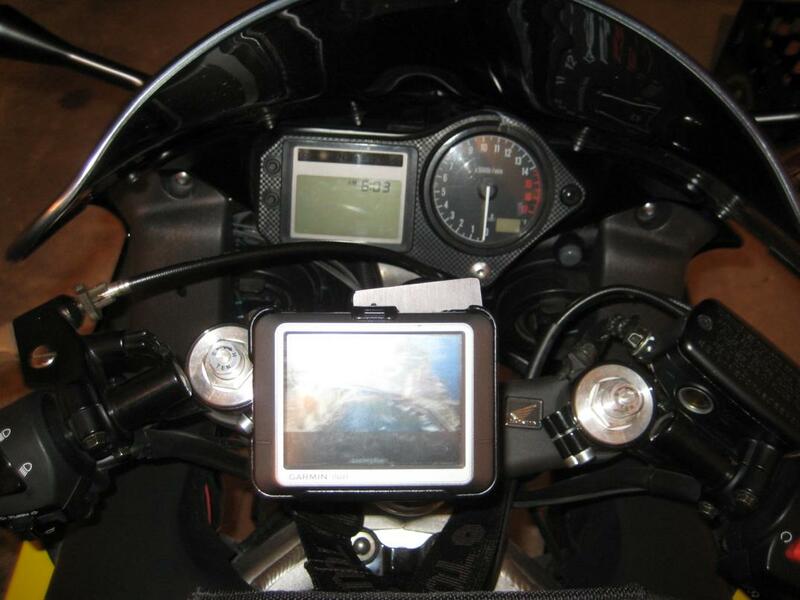 I own a Garmin Nuvi 270. Let me know what yoiu guys think or if you have a better suggestion. Thanks! Push a bolt up the middle, with a washer on either end. When the unit is in the steering stem, tighten the nut on the top and this will cause the rubber to "bulge" at the sides and hold the unit in place. I used gasket rubber to make my rubber plug, but it takes a couple of days to dry. It has the advantage of being a bit shock resistant because of the rubber. I use a 1340 Nuvi in it and it is fine at any speed. See pic. This is a work in progress, I intend to make a rod with a 17mm ball in the top which will screw onto the top of the bolt in the mount. 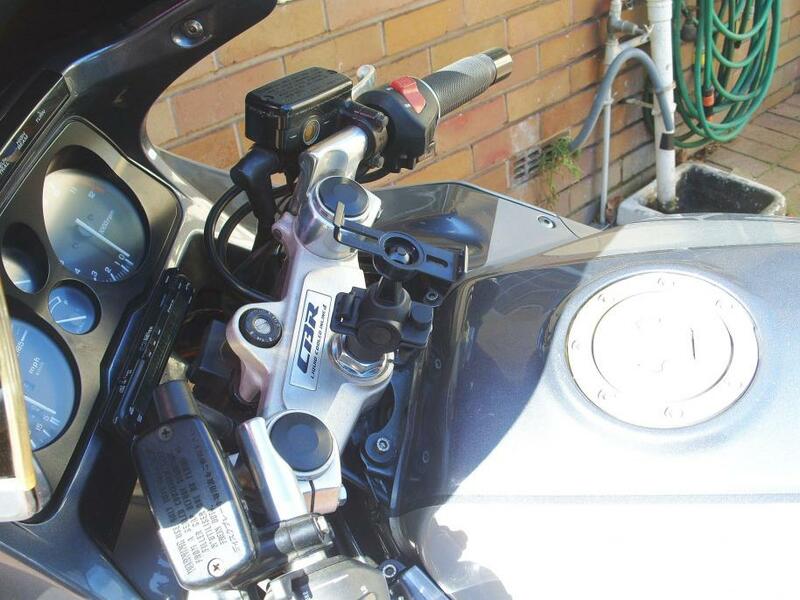 I can then remove the bike fitting I used, and it will look very neat. I think the Ram units are great, but bulky, and some are really expensive. Last edited by Shadow; 01-12-2010 at 06:52 AM. Your setup is what I am looking for, but first let me show you what I am working with. 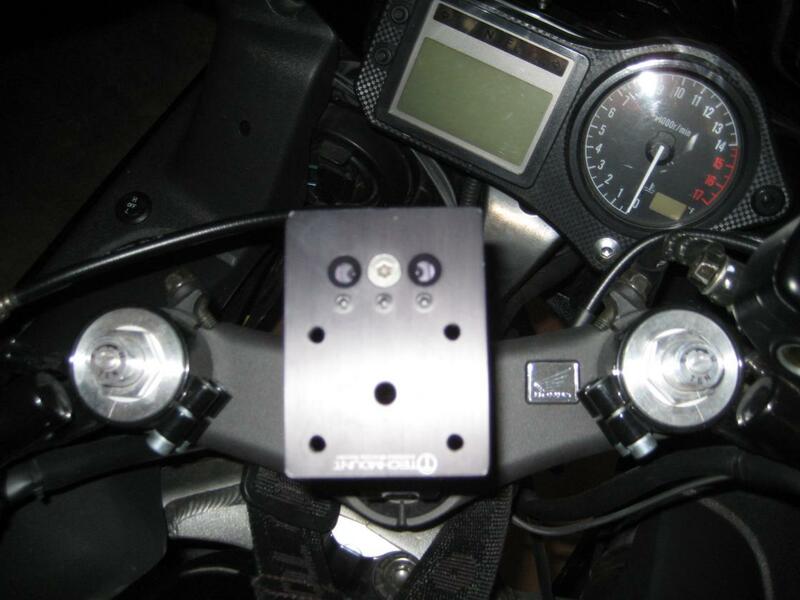 I attached some pics of my TechMount kit that came with the bike. It's a very nice and sturdy kit. It looks like it would hold up to vibrations and the plate can pivot and the arm can be turned. There are several holes pre drilled into the plate and all I need is a bracket that will hold my Garmin Nuvi 270 that will fit in the holes. The holes on the piece from RAM are too close together according to the schematic on their website. Also, where did you mount the 12v adapter. I was thinking of drilling into the unpainted black plastic under the handle bars which would look cleaner. But having the 12v closer to the gauges would keep it closer to the windscreen and hopefully protected from the elements. That seems like a good setup, but I think with an arm that long you will get quite a bit of vibration. 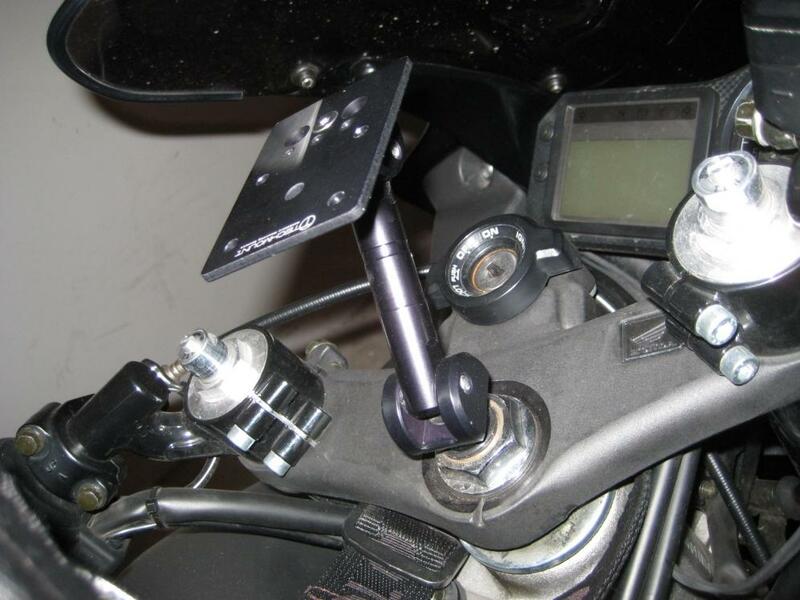 You could just use one of those ball mounts on e-Bay and stick it to the plate - I don't think there's a plate that fits on your system which will mate with the 270 holder. 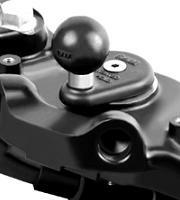 RAM also make a ball unit which will bolt to the plate and be very strong. I would consider shortening the arm on that unit, to reduce vibration, though. Last edited by Shadow; 01-14-2010 at 11:59 PM. The screw holes on the mount are 1.912in center to center and the holes on my gps plate are the same. I think it will be a good fit and it looks secure, but I guess I won't know until I use it. I also plan on either being a cheapskate and keeping a plastic bag handy if the weather gets bad, or buying this water proof bag with a clear plastic window they sell at my local bike shop. Well the RAM mount came in the mail. It fit! 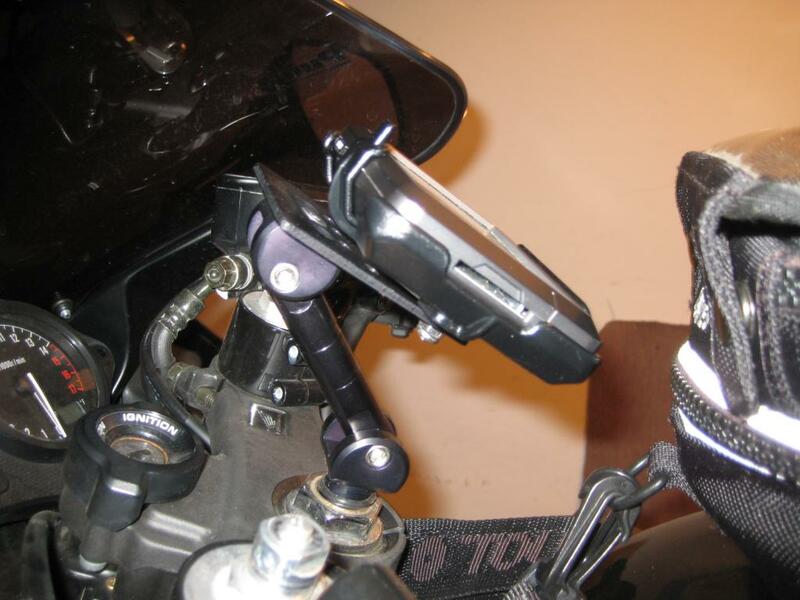 It holds my GPS really well, but I haven't ridden with the new mount so don't know how vibration resistant the setup is. The rAM mount does sit slightly crooked compared to the Techmount mount, but the mount is adjustable on the fly so I still get a great viewing angle. Enjoy the pics and hopefully this post will help anyone else with similar gear. Thanks! Along with short length arm and a cradle for my nuvi. I just got and installed few parts from www.themountdepot.com and I'm very happy with it. What I don't understand is why Ram don't make a mount with a 17mm ball to fit all the Nuvi units ? Why does one have to fit an extension to the 1" ball, which makes for more vibration. it does. i've ordered an extension to be able to move it in case I need to adjust it. the extension is quite solid if you ask me. it's made of metal. as far as the cradle for nuvi (which I have), you could use the OEM one. Last edited by mbison83; 02-06-2010 at 12:23 PM.